On May 20, twenty-four South Side breweries will be gathering for the first-ever South Side Craft Beer Fest, hosted at Baderbräu Brewing Company in the South Loop. To whet our appetites, we held a gathering of our own a month early. These five breweries are certainly not all our side of town has to offer—catch us at the inaugural fest paying our respects to Beverly’s Horse Thief Hollow, Back of the Yards’s Whiner Brewing, Pilsen’s Lo Rez, and more. The Pilsen-based company is by far the largest craft brewery that we sampled from, with a nationwide distribution. They have a wide selection, but we wanted to try something a little more exciting than their standard Pilsner, IPA, or Little Sumpin’ Sumpin’ Ale (an editors’ favorite). Appearance: A little clear, a little golden. Not much to speak of here. Label: Textbook Lagunitas, but with distractingly clashing fonts. As for that name—frankly, we don’t get it. Our ideas: a creative misspelling of “citrusiness”; a play on telekinesis; connotations of early hominid fossils; an illness in ancient Greece. Smell: Hoppy, yes, but also skunky—like the haze above a concert; like our “L” stop in the evening; like the plant recently legalized for medical use in Illinois…there’s no getting around this. It smells like weed. Taste: The solid hops are a bit strange, even dirty, with a noticeable but surprisingly light citrus flavor and a bitter aftertaste. But as far as APAs go, it’s not bad. Drinkability: The skunkiness ruins it for us—we probably couldn’t take more than one. Opinion: The confusing name is ultimately more exciting than the drink itself, an unremarkable pale ale. Appearance: A shade darker than most light beers, this translucent color is just vibrant enough to qualify as golden. Label: Props for the unusual purple, but it leaves us with one pressing question: are we sure we’re not about to drink a can of grape soda? Props, as well, for the surrealist poetry, but we’ve read better. Smell: Look out (smell out?) for the papaya, and it will come through strong, like it should. Taste: An immediate, promising burst of hops with bright citrus notes fades away quickly—this beer gives you everything it has to offer in the first act, with a fairly light aftertaste. There’s the pleasure of a hoppy pale ale without the pain—but the papaya comes through less strongly in taste than in smell. Drinkability: Quite drinkable for a hoppy beer—because its powerful taste evaporates quickly, you’re left wanting more without feeling overwhelmed. Opinion: We wish more of the fruitiness in the smell came through in the taste, and that the taste lingered longer—as it is, this intriguing beer is not as innovative as its label claim.. According to their website, Baderbräu Brewing Company “was founded to revive Chicagoland’s original craft beer, a Czech-style pilsener.” Its founder Rob Sama, who got his start as a homebrewer while an undergrad at the UofC, tracked down the original recipe and yeast stain, and the Baderbräu pilsener was reborn. Check out their taproom, which opened last spring, to try all their brews. Appearance: Golden straw if you like it—or a little too yellow, like PBR, if you don’t. Label: Beautiful font and a great name make this theatrical can a welcome slice of Americana—kind of kitschy, but accessible. The label is a bit too removable, the can a bit too flimsy, but it feels like the right can to pass around in a Bridgeport bar before heading to a White Sox game. Smell: It’s not just “beer-flavored beer,” it’s beer-smelling beer. The scent of plain, light lager might be comforting—or just boring. Taste: Give yourself some credit, Baderbräu—your beer-flavored beer has a little more citrus than your standard lager. Pay attention to that second act, though—after the slight wheaty notes and the hop finish comes a somewhat metallic aftertaste. 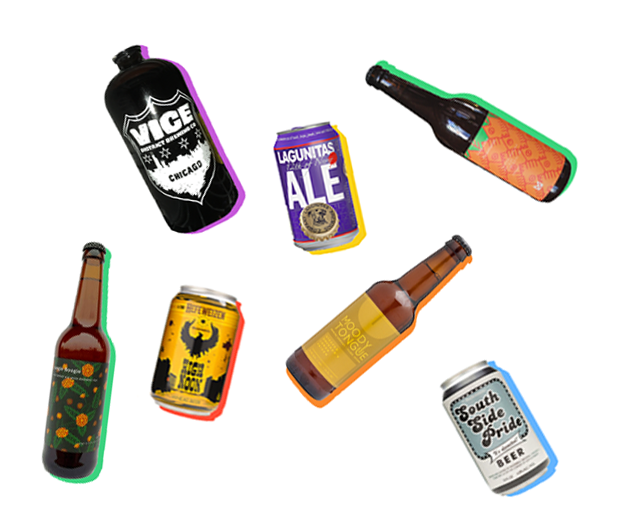 Drinkability: Very drinkable, very inoffensive; a six-pack would go down easy. Opinion: A decent lager to pair with a burger—and a sorely needed lime—on a summer day by the lake. The beautiful label gave us high hopes, but to call this beer the pride of the South Side is a stretch. The South Side is better than this beer. Appearance: Dark golden yellow with a nice thick head—a classic cloudy, unfiltered Weiss beer. Label: With a label that can be described only as “Wild West-themed rollercoaster ride,” High Noon’s kitschy Americana is less welcome than South Side Pride’s. This eyesore need not be a deal-breaker, though—just drink a few more of these. Smell: Definitely comparable to apple juice, but not overpowering—fresh, summery, and sweet. Taste: About as tasty as wheat beers can get, this light, refreshing beer starts smooth and finishes smooth with strong flavors of banana, apple, and bubblegum. It makes us feel like bubblegum does, too—happy. Drinkability: Supremely drinkable, this is the ideal beer to bring to a summer afternoon picnic at Promontory Point. You’ll knock back two in a row before you know it. Opinion: Nothing flashy or risky but undeniably delicious, High Noon Hefeweizen is a real crowd-pleaser. Just use a koozie so you don’t need to look at the label. Appearance: A deep, dark golden brown—almost amber, definitely alluring. Label: “Beautiful” is really the correct word for the floral patterning and sans serif fonts on display here. Graphic design good enough to base your beer-buying on. Smell: Strongly strawberry—maybe saccharine. Childhood nostalgia abounds: think strawberry syrup on ice cream, strawberry candies wrapped in cellophane, wild strawberry-picking. Taste: We’re grateful that the taste is more complex than the smell, but the fruity notes we loved are a bit lost among the hoppy bitterness, which overwhelms the promising hints of rooibos and strawberry. Drinkability: The aroma alone could keep us coming back for more, but this is a beer to sip slowly. The bitter aftertaste is paired with an enticing fruity after-aftertaste. Opinion: We want to love this creative, artful beer but can’t quite go all in. Imagining the possibilities makes its shortcomings all the more disappointing. Still, it’s worth buying a bottle or more. Appearance: Golden, thick, and very cloudy. Label: Another reliably beautiful pattern from Marz—colorful and tropical, with a clever orange pattern. Smell: A hint of fresh citrus, if you strain for it—maybe all the effort was expended on Jungle Boogie. Taste: Considering what’s advertised, let’s call this a surprise. It actually has little to no hops flavor at first, and is quite wheaty and tart for a pale ale. After a period of bitterness, though, comes a sharp, tropical finish, and a soft, sun-soaked, citrusy aftertaste. Drinkability: The unremarkable nose makes it drinkable, but is it enjoyable? Its fruity aftertaste might get tiresome. Opinion: Unlike most beers, it’s heavy on the tail end, but the hop finish is unexceptional—just one of many interesting elements that comes together in an unappealing way. Put it in front of us, fine, but we won’t seek it out. With a rotating selection of drafts and year-round brewery favorites, we tried the Habitual Black IPA on bartender recommendation. If you’re hungry, try their jerky and or even BYOF (bring your own food), but definitely stay for the brews. Appearance: Black as the night, creamy head. Ready to give us a punch to the face. Label: We didn’t think it was possible, but this is too much Chicago in one: stars, skyline, police badge, and city name? Smell: Maple, dark chocolate, almost woody and smoked (it probably was not smoked). Taste: Starts simple, and builds slowly to a complex, bitter finish, one that will have you swearing you just downed a pound of the finest pitch-dark chocolate, with a little bit of sea salt. The malt and dark-roasted coffee notes remain consistent threads throughout. Drinkability: Though more drinkable than most dark beers, since it’s neither too sweet nor too chocolatey, this remains a beer for sipping. Do not overdo it; take it in small doses, like dark chocolate. Opinion: If you do not like dark beers, you will be impressed by but not drawn to this. If you do, feel free to wallow in its decadence. Their Lemon Saison was the consensus favorite, but definitely check out the cozy taproom in Pilsen, adorned with steel, exposed wood, and fireplaces, to try all their rotating drafts. Appearance: Ordinary golden brown, with very little head. Label: Clean, subtle, slick—someone went to design school. The Y in Moody dives down into the U in Tongue to form a tongue. Is this deft illustration enough to save the label from sleek sterility? Smell: Wheat and sweet all the way through. Taste: Light, smooth, perfectly unobtrusive lemon notes. The wheatiness comes through strongly on the nose, and saison notes emerge on the back end for a classic, subtle, and satisfying finish that ties together the experience. Drinkability: Extremely drinkable, great for a summer barbecue—maybe surf and turf? Opinion: Well-crafted—impeccable, even. Not just a casual drink; appreciate the work that went into its flavor profile. Correction 5/2/17: A previous version of this article incorrectly reported that Ed Marszewski is the owner of Maria’s Community Bar and Packaged Goods. In fact, Ed’s brother Mike owns Maria’s, while Ed runs Marz Community Brewing Company.